Tarraville is situated on the Tarra River, north of Corner Inlet, Gippsland, about 175 km south-east of Melbourne. It was named after Charley Tarra, an Aboriginal who acted as a guide in the area. Attracted by favourable reports of land, Reeve's Special Survey was selected east of the Tarra River in 1841. A private township was surveyed in 1843. Its location on the route from Port Albert to the hinterland guaranteed rapid growth. By late 1844, the village had some 50 buildings, mainly constructed of brick. In 1851, a government township was surveyed on the southern boundary of Reeve's Survey but was slow to develop. 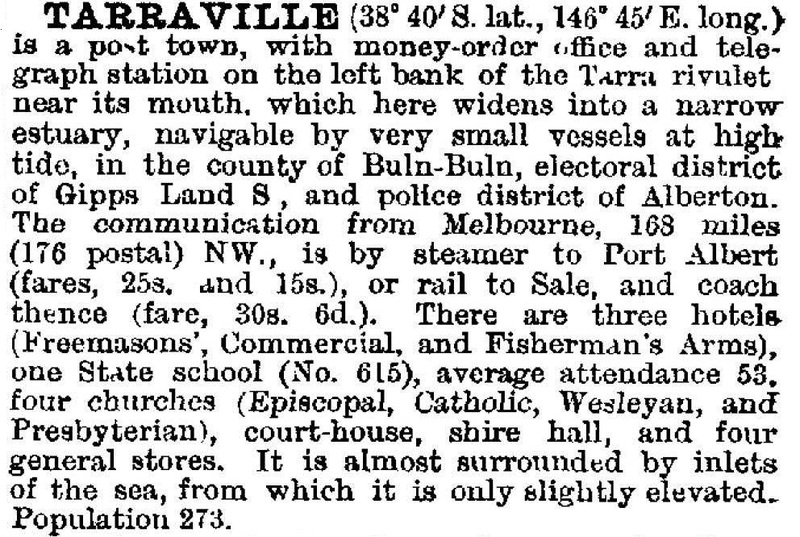 In the 1850s Tarraville was the largest town in Gippsland, with seven hotels at its peak, numerous stores and businesses, a police station, courthouse and gaol. A school commenced in 1856, but private schools had operated from 1848. A mechanics' institute hall was built in 1859. Alberton Shire, formed in 1861, was administered from Tarraville for some years. In 1860, a tollgate was installed at the bridge over the Tarra River. The main occupation at Tarraville was carrying, supported by blacksmiths, wheelwrights and saddlers. Feed for horses and bullocks was produced on surrounding farms. There were several tanneries and a brewery in the area. As well, a few professional fishers operated from Tarraville. The arrival of the South Gippsland railway at Port Albert in 1892 did not stop the decline in trade. The administrative centre of the shire moved to Alberton, the government township to the west. By the turn of the century, most of the main buildings in Tarraville were gone. Farmers have diversified into pig production, farming free range rare breed Wessex Saddlebacks. The Living History Museum established a trail of 18 significant sights and published an information booklet for interested visitors. The renowned opea singer Ada Crossley came from Tarraville. In 2009 the community developed their community plan. Things they did not want included shops and sealed roads.